Thanks to Zach and Jody Gray of Nashville, TN for these images! We met while living in Washington, D.C. After 4 1/2 years of dating in the midst of military and government service craziness, he proposed at the peak of a volcano while vacationing in Kauai, Hawaii. It was almost the shortest engagement in history. (Ask us to tell you the story, it's pretty funny!) Thankfully we survived and 8 months later, we had an outdoor wedding at a vineyard just outside of D.C. Without a doubt, the very best day of our lives. Three years later we made the move to Golden, CO. We have now been Colorado residents for over three years and our love for the active, outdoor life has found the perfect home here in the mountains. We spend our free time hiking, camping, skiing, and trail running. Our dogs are our babies and we spoil them waaaaay too much! 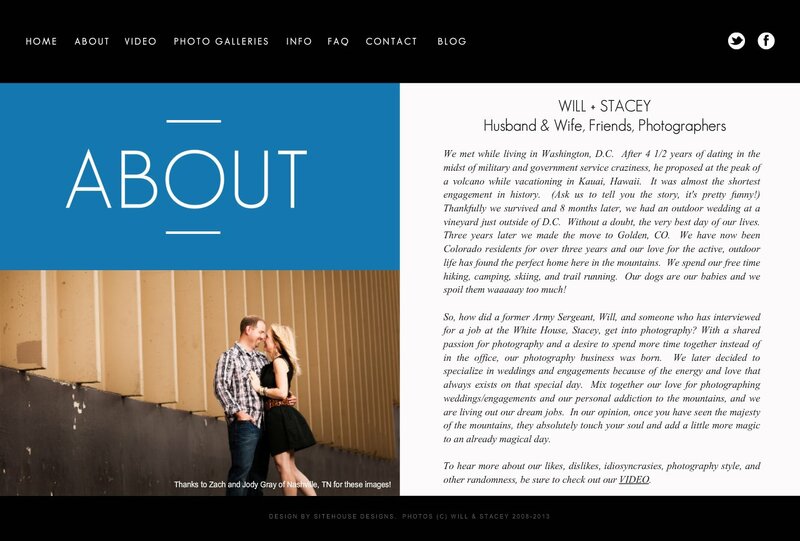 So, how did a former Army Sergeant, Will, and someone who has interviewed for a job at the White House, Stacey, get into photography? With a shared passion for photography and a desire to spend more time together instead of in the office, our photography business was born. We later decided to specialize in weddings and engagements because of the energy and love that always exists on that special day. Mix together our love for photographing weddings/engagements and our personal addiction to the mountains, and we are living out our dream jobs. In our opinion, once you have seen the majesty of the mountains, they absolutely touch your soul and add a little more magic to an already magical day. To hear more about our likes, dislikes, idiosyncrasies, photography style, and other randomness, be sure to check out our VIDEO.